The last update was back in June 2015 and oh boy, lots of things have changed since then! Looking back, things sure looked optimistic then. Things however, kinda swayed towards another direction after that. To put things simply, things kinda went downhill and I’m still sort of recovering from it even now. I’d like to write about what happened in between the 2 years gap. This peaceful park used to be part of the Edo Castle. Few months ago I’ve quit the digital marketing agency that I’ve been working for about 2 and a half years. I’m grateful for the opportunity to grow at the agency, as well as giving thanks to my awesome colleagues who had supported me back then. Without the experience working in the agency I would not be able to got my current job. That being said, while I had great relationships with my colleagues at the agency, there are some things that I couldn’t agree with the agency that prompted me to seek for opportunity elsewhere. Taken during summer 2016 when visiting Izu with colleagues. It was one of the better times. I was very lucky to have met the right recruiting consultant which happened to have a client (my current employer) in need of a SEO specialist to join their company. The whole process happened faster than I expected as I managed to progress from the first meeting with the recruiter to getting the job offer all within a month. Currently I’m working as an in-house digital marketing specialist, specializing in SEO while also looking into content marketing and social media fields. It’s a highly competitive industry and I’m still picking up something new day by day. Then again, the more things that you don’t know, the more eager you’d want to learn more about it. Looking forward for the opportunity to build up my skills and experiences to advance into this digital marketing field. Speaking of which, perhaps one day I shall write something about digital marketing, as I’ve been involving in it even without realizing it. Company trip to Hiroshima. It was a solemn experience and looking forward to revisit the city again one day. Physically, thankfully not much major issues. I really should work out something to reduce the belly, and somehow i started to feel the symptoms of aging, though I’ve yet to reach 30’s. Mentally, that’s a different story though. To be honest, I wasn’t at the best state of mind for the past few years. A few months right after the last blog update, something happened which prompted me to reshuffle my priority to be more immersed with the work. From that onward, things worsen while I wasn’t aware of it and the moment when I realized something wasn’t right, it was too late. Some days I would work close to the 11th hour, literally. At the moment I’m slowly recovering from it. Rather than keeping within myself I’d prefer to speak it out. Am considering of writing it out at some point, as mental well-being issue is not something people would be eager to talk about it openly, however if left unchecked it can destroy a person from the inside. A bit of anxiety, but I wouldn’t call it as a depression, as it’s way messier than what I’ve been through. My case is considered juvenile compared to what those who had severe depression been through. There were times when I do not look forward walking to the end of this corridor. Perhaps I should have acted earlier to pull myself out of the mess, but better be late than never, as now I’m slowly taking steps to regain my life back. Updating the blog here is one of the initiatives to have myself do what I used to enjoyed doing. Besides writing, I’m also thinking of getting involved with sports again and have a real proper vacation for myself, sometime in 2018. Those who had stayed in Japan for an extended period of time will inevitably face the fact that the social circle is shrinking year by year. 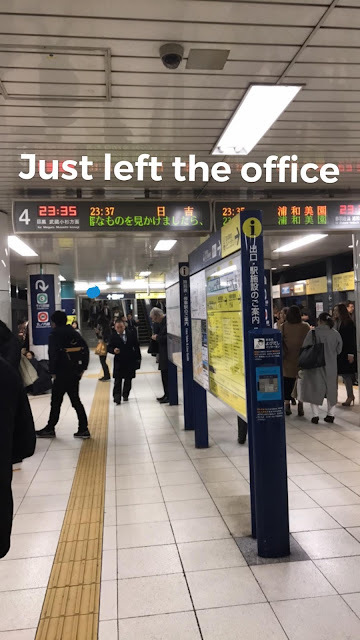 Many people are eager to come to Japan, but after experiencing the reality here, some decided to leave and go somewhere else, which is totally fine. I used to laughed that some people said that they don’t really have any friends, but now I started to feel the same and can understand their sentiment in it. As we advance into adulthood, we have different priorities to take care off, and we tend to be more selective on choosing who to hangout with. If you look into yourself, nowadays we tend to spend more time with colleagues than our friends, isn’t it? The most obvious solution for this, is to get to know more new people. The winter illumination at Tokyo Midtown is one of the popular spots in the city. Which brings us to another topic which I’m frequently asked, whether I’m seeing someone. At the moment, I’m slowly regaining back control of my life after the hectic working hours at the previous workplace. I’m looking for someone whom I’m willing to commit much of my time on. Hopefully, in 2018 I can have an answer for it. Another reason why I seldom update the blog, is because iPhone is good enough to handle most of my daily usages of Internet. Personally I find this change surprising as back then I was known as the kid who couldn’t live without turning on the computer for a day. Now, I haven’t switch on my personal laptop for almost 2 years! iPhone 7 Plus' size is almost exactly the same as the original Game Boy. Another reason would be, after starring at the computer screen for about 10 hours a day at work makes me shun computer during the off days. On weekends I would wonder outside rather than spending the time indoor playing with computer. The priority of spending the off days too, has changed drastically in that sense, as having a mobile device means you can get connected anywhere no matter where you’re going (except for places with poor mobile reception). Now that this is the end of 2017, as usual I’d like to write down a few resolutions for next year. ・Cycling - There are still a lot of places to be explored in Tokyo! ・Photography - I’m taking pics mostly on iPhone but am thinking of getting back into my faithful Canon. ・Writing/Composing - Training to express myself better by updating this blog more regularly. ・Traveling - It's time to have a proper rest, as I haven’t had a long vacation ever since I’ve started to work. Likely to be around Tokyo for some time.